Head down to Mexico for the adventure of a lifetime in Yggdrasil’s Lucha Maniacs slot. This 20 payline game features vibrant graphics and a fantastically fun theme with a countless bonus features that include extra wilds, free spins and transforming symbols. A top prize of 200x is available while you spinning the reels on this thrilling online slot. Read our full review below. Lucha Maniacs is a 20 payline online slot from Yggdrasil Gaming. You can wager anywhere from 20p to £100 per spin, and all of the buttons you need are located along the bottom of the screen. You can use unlimited autospins. There is the option to pllace a Golden Bet to enhance your overall gaming experience by triggering extra bonus features. What this means is that you’ll have one extra bonus during your free spins round. What Is the RTP of Lucha Maniacs Slots? The RTP of Lucha Maniacs from Yggdrasil Gaming is 96.2%. This payout percentage (also known as ‘return to player’) lets you know how much money the same pays out for every £100 wagered. It is also a medium volatility game, which means that you should earn prizes consistently. You’ll receive payouts more often than in a high volatility game but they will be a bit less generous. To hit a winning combinations while playing Lucha Maniacs, just land three or more matching symbols on the same payline. The top prize available is 200x for the red and pink luchadores, and the golden symbol is the wild that helps boost your overall chances of hitting prizes by substituting for all other symbols. When just two bonus symbols land on the reels, you’ll be able to enter a Pick a Prize bonus. You’ll be presented with 3 luchador posters and prompted to pick one. Three of the posters peel away to reveal a prize while one will take you to the free spins round. These can be mixed and matched to help boost your prizes. As you select your features, the excitement definitely builds! You only need two more scatter to earn you more free spins. Normally, slots games require you to have three or more symbols for a retrigger, but this game keeps things interesting by making it easier for you. 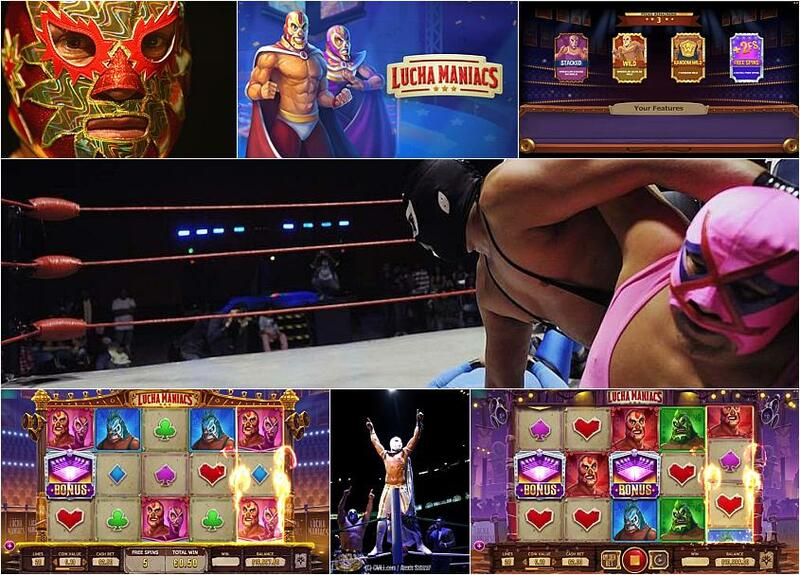 Like all slots from Yggdrasil Gaming, you’ll be able to play Lucha Maniacs from any tablet, smartphone or PC. This is because the game runs on HTML5, which means that it can be played within your web browser. You don’t have to download any software, and the game will resize to fit any screen. With its vibrant graphics and huge range of bonus features, Lucha Maniacs from Yggdrasil Gaming provides players with a thrilling online gaming experience. There is no way you’d ever get bored while spinning the reels on this slot, as there is always something going on to hold your interest. Yggdrasil has done an amazing job of creating immersive gameplay that is ever-entertaining, and this game should appeal to all types of slots players. Can I Play Lucha Maniacs Slots For Free? Lucha Maniacs is free to play here at Slots Temple. You don’t have to sign up to an online casino or make a deposit to give it a spin. Is There A Strategy For Winning At Lucha Maniacs Slots? There is no way to actual guarantee a win while playing at Lucha Maniacs, but there are ways to maximise your winning potential. Think about using a betting system like Martingale, which requires you to raise your bet on any loss. The main idea is that you would eventually win and make your losses back while earning a profit. You can also use the Golden Bet to add to your free spins feature and earn more generous prizes. Does Lucha Maniacs Slot Have Free Spins? There is a free spins round in Lucha Maniacs slots. You can trigger it from the Pick a Prize round or by landing three or more scatter symbols. Can I Win Real Money While Playing Lucha Maniacs Slots? If you sign up to an Yggdrasil-powered online casino, you’ll have the chance to win real money prizes after you make your first deposit. Can I Play Lucha Maniacs Slots with No Deposit? There are no online casinos that offer Lucha Maniacs as a no deposit slot. However, you can give it a spin for free at Slots Temple and there is no need to make a deposit or sign up to a site. Can I Download Lucha Maniacs Slots? Yggdrasil’s Lucha Maniacs slot is available to play as a browser-based game that does not require any downloads. * Lucha Maniacs trademark / license is owned by Yggdrasil Gaming. This site is not endorsed by Yggdrasil Gaming.